BADCC is able to run range of introductory and intermediate canoe and kayak training courses using our British Canoe Union (BCU) qualified coaches. Our more experienced coaches are able to offer training on advanced white water. We also provide safety and first aid training courses and occasional "hints and tips" in our newsletter. Introductory courses are run separately for both juniors and adults. The junior courses follow the BCU PaddlePower programme, which has been designed to suit young people and is primarily aimed at the under 14s. PaddlePower is continuously assessed. Adult courses follow the requirements of the BCU Star Awards. Intermediate courses are currently available for white water kayak and sea kayak. We run a series of modular courses which aim to take paddlers through to at least BCU 3 Star standard. 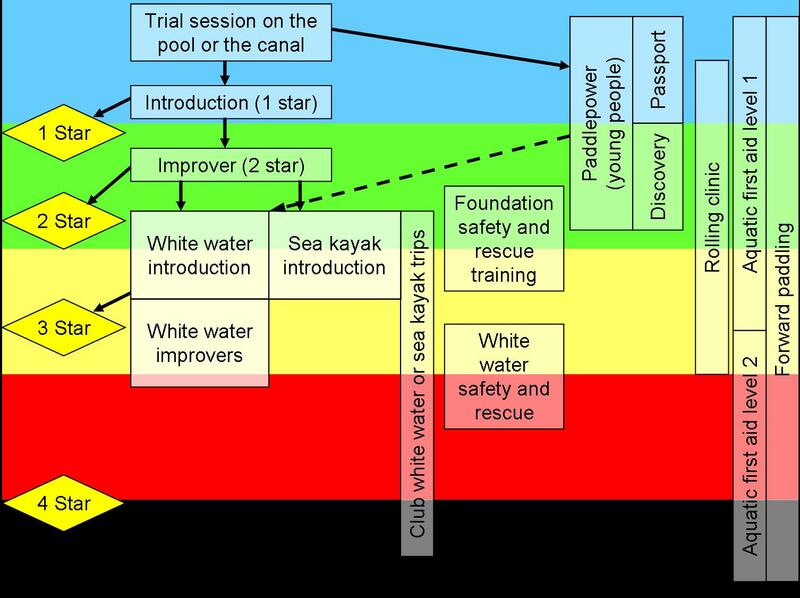 We also run courses that are focused on our members needs, for example the Introductory White Water weekend each October. BADCC runs assessment sessions for BCU 1 star, 2 star, 3 star white water and 3 star sea kayak. The assessments are run separately from courses as some paddlers do not wish to be tested after a course and others do not need a course to reach the required standard. BADCC runs the BCU Aquatic First Aid Level 1, an 8 hour first aid course, two or three times each year, and have recently started running the Level 2 award, a 16 hour first aid course. There are no pre-requisites and the course can be taken either as first course or when a current first aid certificate has expired. Training for the BCU Foundation Safety and Rescue Training is run at least once each year. We started running the BCU White Water Safety and Rescue training last year. The Club runs a wide variety of courses and training opportunities for members. Trial sessions and introductory courses include temporary Club membership. This page should help you which courses would be appropriate for you. BADCC is fortunate to count 11 BCU qualified coaches amongst our members. BCU qualifications start at Level 1 (assistant coach) and run through to Level 5 (expert). Levels 1, 2 and 3 are aligned with the UK Coaching Certificate. The Club is keen to support members in gaining coaching qualifications. We can do this by helping you with grant applications. In 2011 the Hampshire Youth Games will be held on 11th June.